The benefits from the Hartland Dam reconstruction project are several, and important to sportsmen, recreationalists, irrigators, and to environmentalists concerned about native fish habitat. According to a narrative of the project distributed during the dedication, “The primary purpose of the project was to provide fish passage, but other benefits were considered when designing the project. The Hartland Diversion Dam was an extreme safety hazard to boaters. 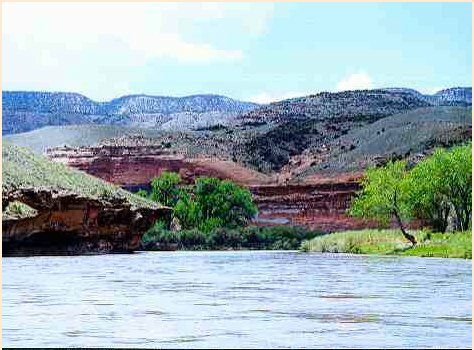 Addressing those safety issues provided a continuous corridor for boaters and greatly increased safe access to recreation on the Gunnison River.” The dam had been the site of river rafter deaths over the years. More Hartland Dam coverage here. [County Commissioner Olen Lund] pointed out that there’s a lot of private ownership along the banks of the river, and private owners aren’t always receptive to river floaters and their sometimes inconsiderate ways. A county-sponsored public meeting of river corridor property owners took place in 2006 at the Bill Heddles Recreation Center. That meeting resulted in a deluge of opposition from landowners against promoting river recreation in the county. The meeting fairly stifled any broad discussion of the concept, until now. Now, with the Hartland Dam reconstruction project connecting the river to boaters above and below Delta, and with the availability of GOCO money for comprehensive river corridor planning, the Gunnison River recreation idea has re-emerged. Painted Sky Resource, Conservation and Development Council (RC&D) awarded the ﬁnal design contract for the Hartland Dam project to McLaughlin Water Engineering on March 19. McLaughlin, a Denver company, has experience in designing ﬁsh and boat passage projects in rivers with high rates of ﬂow. McLaughlin will complete the ﬁnal design by mid-June 2010, according to the updated project schedule. After approval of the ﬁnal design, Painted Sky will release bid packages for construction. Slated to begin in August, construction should be completed by the end of October 2010. Three workers, under the Teens on the Farm program, have been helping take down and move fences on private land bordering the program site on the Gunnison River near Delta. Painted Sky started site prep work in mid-March. Three boys, paid through Teens on the Farm, a non-proﬁt program in Delta County, helped move and take down fences on private land bordering the river. ECO Contracting, LLC built a berm and prepared a site for rock storage. Dirt Merchants Construction was hired to install a culvert and improve the access for delivery of rocks. McLaughlin started work for the ﬁnal design on March 29 by gathering data to map the river bottom. McLaughlin engineers will use the data to understand and predict how water ﬂows over the riverbed. Their design must provide for the impact of up to a 100-year ﬂood event. Using laser-surveying equipment similar to devices used for surveying along roadsides, one man stands on the riverbank aiming a laser beam. A second man in a wetsuit stands in the river, holding the laser’s target. The team spent two days taking measurements 1,000 feet above the current dam and 1,000 feet below the dam. The Hartland Dam Project will insure Hartland Irrigation Company’s access to their senior water rights and improve boater safety while traversing the dam. The ﬁsh passage will reconnect river habitats and ﬁsh populations above and below the dam. As it exists now, the dam blocks three threatened species of bottom-dwelling, native ﬁsh, the ﬂannelmouth sucker, bluehead sucker and roundtail chub, from swimming upstream past the dam. For more information, contact Mike Drake, Painted Sky project manager at 970-527-4535 (ofﬁce) or cell 801-710-8372 or NRCS coordinator Paul Van Ryzin at 970-874-5726 ext. 133. The money enables Delta’s Painted Sky Resource Conservation and Development Council to proceed with the dam replacement. “This is incredible,” said Painted Sky Project Director Mike Drake in a news release from the Fish and Wildlife Service. “The level of coordination and the amount of work put in by all parties made this project possible. The entire area will benefit from this project for years to come.” The project is a cooperative effort between Painted Sky, Fish and Wildlife, the Colorado Water Conservation Board, private landowners and recreation organizations, plus other state and federal partners. The 6-foot Hartland dam will be removed and replaced with a new, natural boulder field structure. The service previously committed $600,000 of stimulus funds and $200,000 through the National Fish Passage Program for the project. Modifying the dam structure has three objectives that will benefit fish, Hartland Dam Company, boaters and private landowners. First, the dam has blocked the flannelmouth sucker, the bluehead sucker and the round tail chub from habitat upstream of the dam since it was installed. A fish passage in the new design will reconnect populations of fish above and below the dam, increasing their available habitat. Although not endangered, these three fish are species of concern to USFWS, making this the top priority for Region 6 of the USFWS. Second, all modifications must allow Hartland Ditch Company to access its full water decree. The third objective of the project benefits recreational boaters and private landowners on the riverfront near the dam. After the project completion in the spring of 2010, boaters crossing the dam will be safer and less tempted to trespass by portaging around the dam.